Planning a corporate event is definitely not easy. There are a lot of things to do and a lot of people to talk to. And then there is the all-important budget. If this is your first time organizing an event, chances are you may make a mistake or two along the way. These mistakes, no matter how small, may end up costing you a lot of money. This isn’t good considering how expensive it is to plan an event. To prevent this from happening, we have put together a list of the most common mistakes event managers commit while organizing a corporate event. Keep these things in mind to ensure that your event will be a success. Here are 4 critical mistakes to avoid when planning a corporate event in Chicago. Planning a corporate event takes time. So make sure that you start working as soon as you know the date of the event. Start by looking for venues. Hotels and other venues get booked fast, so it is important to start looking as early as possible. Failing to start the event process early will limit your venue choices and may even cause a host of other problems down the line. Before booking a venue, you need to have a good idea how many attendees you are expecting for the event. A small function room will be too cramped for 200 guests. A larger venue may look too big and empty if you only have 100 attendees. Before committing to a venue, ask the advice of the staff to find out the capacity of the venue. Also, find a happy medium between the numbers you expect. A bigger space is a lot better than a small space, just don’t go overboard. Planning a corporate event can be exhausting and stress-inducing. It requires months of planning. The sooner you realize that you can’t do everything on your own, the better off both you and your event will be. Seek help from your colleagues and try to delegate some tasks. This way, you can do things more efficiently and in a timely manner. Having enough staff on hand at the event itself is also of great importance. There should be enough staff to accommodate all the attendees and ensure that the registration process goes on smoothly. No matter how well organized or planned an event is, things can go awry on the Big Day. As such, it is important to have a Plan B in place just in case things go haywire. We cannot predict the future, but it is a good idea to plan for the worst. Before the event, try to determine which areas where your event’s success could be jeopardized and have a contingency plan in place. Corporate events provide several benefits to your organization. Hosting symposiums, conferences, business meetings or company dinners reinforces your image as an industry leader and creates networking opportunities. It helps foster and strengthen relationships with customers, clients, and employees. It also builds loyalty and can help you close sales. Corporate events can be stressful and time consuming. They require careful planning and budgeting. The planning process becomes even more challenging when you’re working on a limited budget. 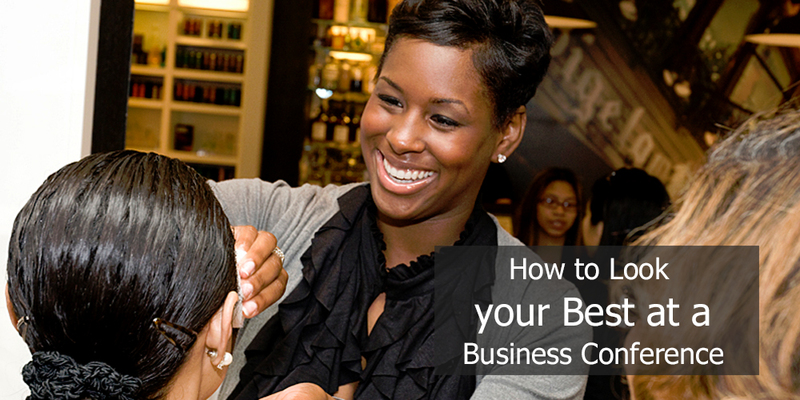 Your brainstorming ideas can be put on hold once you realize that you may not have enough money for your next event. Here are some great tips for corporate event planners who are looking to use their budget wisely. Advance planning is beneficial to land the best speaker for your event. The earlier you contact the person, the better. Other speakers bump up their rates as their calendar fills up. To avoid this, we suggest that you contact a professional speaker at least 6 months prior to the event. It is also a good idea to book a speaker who already has an appearance booked in your area. This secrect can help reduce your expenses since you will no longer need to spring for transportation and lodging. Food and snacks is one area where you can really make the most of your budget. Instead of a sit down meal, consider offering buffet. Buffets eliminate the need for a large wait staff, and they take up less time in the schedule, too. Another added bonus is that buffets provide attendees an opportunity to interact with one another in a more comfortable mealtime environment. Finding a venue is one of the most challenging parts of planning an event. There are a lot of things to consider when looking for one. Of course, you need to consider your budget, the attendees, and the accessibility of the venue. You want to make sure that the venue fits your budget. Also, find one that will be able to accommodate all the attendees. There is no point in booking a big venue if you are only catering to a small group. Some of the savvier companies have gotten really creative when they’re putting on events. One way to make the most out of your budget is to seek sponsorships for your event. Find a budding company that is looking to get their name out in the public. Often, they don’t charge much for their services. Others would even offer their services for free. Take advantage of that. Planning a corporate event can be a tricky endeavor. Whether you’re planning a seminar, conference or a customer appreciation day, you probably have a long list of items to complete – venue, food, flowers, decorations, seating charts, speakers…the list goes on. But who’s going to capture all those moments during the event? Special events for your business deserve the attention and eye for detail that only a professional photographer can provide. You only have one opportunity to capture your event in all of its glory. It can be difficult to convey the story of your event without great photos to back you up. As such, it is important to hire a professional photographer for your event. Here are some things you need to consider when hiring an event photographer. Every photographer has their own unique style. This “fingerprint” is what sets their work apart from everyone else. When hiring a photographer, take their photographic style into account. Do they focus on close-ups? Portraits? Candid moments? These are just a few styles to think about. You can’t hire a photographer and ask him to use a different style; it doesn’t quite work like that. Check out some sample photographs from various photographers to determine whether or not their style suits your needs. This will also ensure that they’re the best fit of the occasion. Before making a decision, ask to see the photographer’s portfolio. Some photographers feature their portfolios on their website. If so, spend some time and browse through those photos. Through the collection of photos, you’ll get a sense of the depth of a photographer’s work. If you like their work, go head: take the next step and reach out to them! Skills and expertise are incredibly important in capturing great photos for any event. However, also consider how they work with their clients. What is their work ethic like? Are they punctual? Do they dress appropriately? This is where references prove invaluable in your decision-making process. Ask the photographer for references, testimonials or endorsements, preferably previous customers, partners and fellow photographers. Get in touch with these people to see what they think of the photographer. Also, ask previous clients whether or not they are satisfied with the work. A true professional will have no problem offering as many references as you need. You may also want to search online for any potential negative comments. Of course, you must keep your budget in mind when choosing a photographer for your event. We all need to operate on a certain budget. As such, it is important to hire a photographer that can deliver the job, while staying within budget. That being said, be sure to have a realistic budget for your needs and location. Like most things in life, you usually get what you pay for. Look for experience and an extensive portfolio and an established professional with a documented history. Hire the best photographer you can afford. When you pay more attention to your wardrobe, people are more likely take you seriously and are more willing to listen to you. So if your aim is to impress people at business events, make sure you put some effort into your style and appearance. In this blog post, we’ll give you some guidelines on what to wear at a business conference. Follow these tips and dress to impress at your next business conference. Smaller business conferences are typically business casual. For men, khaki pants and a long-sleeved button down shirt are a good choice. For women, a knee-length skirt or casual pants may be worn. You can pair it with a silk, knit or cotton blouse. Solid, neutral colors are always in style. Choose a top that flatters your figure without being too revealing. Think of the “classic” look, and you’ll be in good shape. International conferences, on the other hand, tend to be more conservative. In this case, a tailored suit is a safe bet. For women, a tailored dress or skirt with blouse and a blazer is recommended. No matter what you decide to wear, you clothes should look good, be comfortable and make you feel confident. Although it’s okay for women to wear your hair down, make sure to keep your hair off of your face. Not only will you have to constantly push your hair back, it will be too distracting to the person you’re speaking to. A low pony tail is an easy, comfortable way to maintain a neat look throughout the day. For men, just keep your hair well trimmed. If you’re not used to wearing high heels, don’t force it. Opt for a low-heeled, closed toe shoes instead. The more comfortable you are, the more confident you feel. Men can opt for a casual loafer or a lace up style shoe. Black or brown leather are ideal, just make sure your shoes are polished and in good condition and match your belt. There is no better place to increase your awareness of new trends in your field than an industry conference. 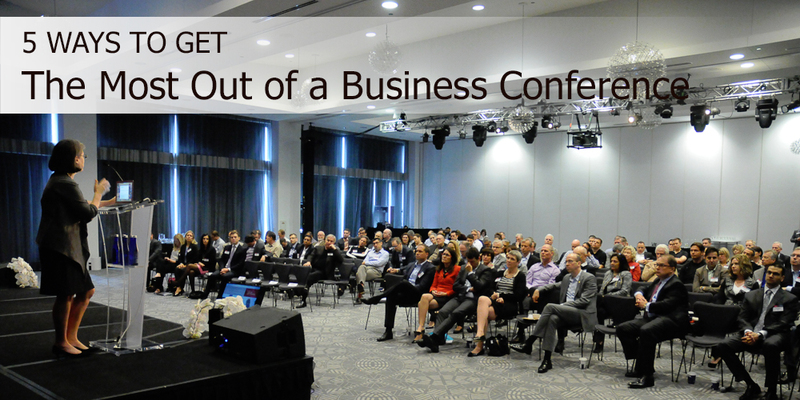 Some people use industry conferences as an opportunity to expand their existing network. These new connections can turbocharge your career and the presentations and seminars can teach you things you can’t pick up elsewhere. But with so many speakers to hear and so many panels to attend, conferences may seem a little overwhelming. This sentiment rings especially true for those who are new to the professional conference scene. If that describes you, here are 5 ways to get the most out of a conference. What are you hoping to learn from this conference? Determine what you hope to gain from the conference before you get there. Going to a conference without any goals can be a waste of time and money. Your goals don’t have to be very specific. They can be as simple as meeting new people, gaining awareness about a particular topic, or to better yourself and bring new knowledge back to your team. If there is a particular person you’d like to meet, carve out time to accomplish that goal. If that person is a speaker or a presenter, send an email prior to the event and introduce yourself. Let the person know that you’re coming to his/her session and that you’re eager to meet them. Whenever possible, let them know how you can help them; they may be more inclined to spend some extra time talking with you! Before you make the decision to go, we recommend that you determine who the speakers are. Then, do some research on Youtube or Google and watch their videos online. By doing so, you’ll get a sense for their style and substance. Plus, it will give you an idea how much value they’ll bring to their upcoming presentations. This is also a great opportunity to think of questions you may want to ask during or after their presentation. We get it. You decided to attend the conference to gain new ideas or insights about your industry. However, the most interesting moments often occur in between or after the sessions themselves. The conversations and interactions you have with the other attendees are often the most memorable and valuable you will have at a conference. On the day of the conference, make sure you register early. This allows you to maximize your time meeting new people before the sessions begin. With days full of speakers and sessions, it can be difficult to remember everything you have learned during the conference. To help you remember what you have learned, we recommend that you take down notes. Also, don’t forget to write down 3 key takeaways at the end of each session. Make sure you follow up with everyone you met after the event. Reach out to them. Email is a completely reasonable way to follow up with someone. Don’t wait too long, either: you’ll want to make sure they still remember you while the event is still fresh in their mind! It’s important to keep those contacts handy, even if you don’t work together immediately. When preparing for an event, your ultimate goal is for the event to go off without a hitch and for the event to be wildly successful. But no matter how meticulously you have planned for your event, some things can still go wrong. Missteps could lead to a drained budget, alienated speakers, and annoyed audiences. While some hiccups are to be expected in such events, learning from others’ mistakes can help prevent mishaps that may materialize later on. Here are 4 mistakes to avoid when planning your corporate event in Chicago, along with some suggestions on how to mitigate them. 6 months may seem like a long way off. But with so many things you need to do, you’ll be surprised how quickly days pass by, and weeks turn into months in the blink of an eye. The planning process should begin as soon as you get word out about the event. If you wait until the last minute, you may have a hard time finding a good venue, hiring vendors, and getting the word out about your event. The sooner you get organized, the better off you’re going to be. 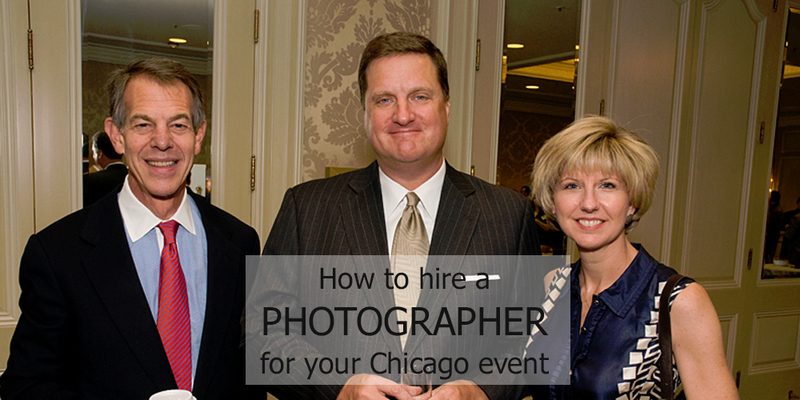 Especially if you want to hire a Chicago corporate event photographer, you will need to schedule in advance. Planning an event is no easy task. No matter how small your event may be or how good of a planner you are, you can’t do everything on your own. If you do, you are likely to end up stressed, exhausted, and frustrated. Your event may also suffer. Coordinating with multiple vendors and important event details is enough to keep you occupied. Learn to delegate. Let your team handle other aspects of the event such as promotions, registration, financial planning, and scheduling. Make sure every little detail of the event gets covered. There will be some unexpected changes during the event, so make sure that you have a back-up plan. Anticipate the unexpected so you can ensure everything runs easily, amid the sudden changes. There is no such thing as a one-size-fits-all venue. Make sure you have a rough estimate of how many people are going to the event before booking a venue. Otherwise, you may end up having a spacious venue for too few guests or a small space for too many guests. If you need someone to photograph or film your Chicago event, please contact me for your corporate event photography needs. 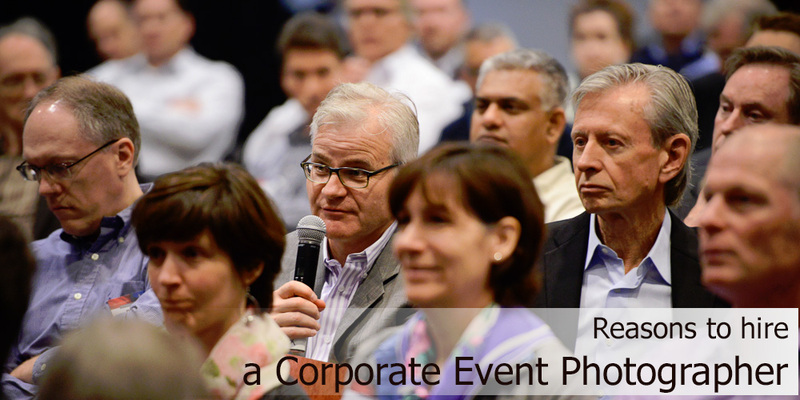 The term “corporate event” covers a wide variety of gatherings, ranging from a promotional event to an annual meeting to an industry-specific gala. In this event, your employees, clients and other guests gather in one place. So much time and effort goes into putting these on, and they are often so fun; it is worth ensuring that every moment is captured. Hiring a corporate event photographer for your event is an important, and wise, business decision. We’ve outlined just a few reasons why you should hire a professional corporate photographer for your events. Just like with any profession, professional photographers spend a lot of time and money to educate themselves and are constantly continuing that education with supplemental training to hone their skills. They use their abilities and training to capture those once-in-a-lifetime moments in the way that only a professional conference photographer can. They focus on things big and small and pay attention to the smallest details that turn an ordinary picture into a stunning, compelling photograph.Great photography reflects well on your business. And the kicker? Great photographs drive sales. While you can always hand the camera to a friend or a staff member, there is no guarantee that they would capture great photos the way a trained corporate photographer would. When you hire a professional photographer, you are paying for their service and experience in exchange for high quality, memorable images. Remember, taking great photos more than just pushing a button. A quality corporate event photographer has the commitment and composure to work for long periods, finding the “narrative” of your event and weaving these stories together in a truly special way. Corporate photographers also maintain a level of professionalism your brother-in-law or friend may not. They are working for you, and they are invested in your satisfaction and their results. There is no denying that having good equipment is one of the key factors towards achieving great quality photos. Photography and camera equipment is expensive. A digital camera or the camera on your phone isn’t going to cut it. Don’t trust your event to just anyone; hire the pros! A professional photographer doesn’t just hand you a flash drive containing all of the pictures that were taken during the event when they’re done. Part of the service and product offering is that your corporate event photographer takes the time to edit your images to ensure that they are properly exposed, cropped and color corrected. When your next corporate event is on the calendar, give the professionals at G. Thomas Ward Photography a call and learn how we can work for you.